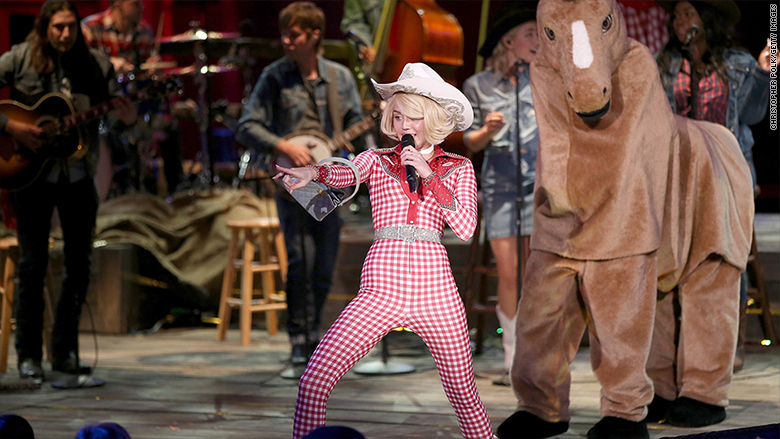 Miley Cyrus performed a performance on "MTV Unplugged" in 2014.
Who says MTV doesn't play music anymore? Viacom (VIA)'s MTV network is returning to its roots by bringing back an old favorite, "MTV Unplugged." On Thursday the network announced new "Unplugged" episodes and an ambitious new series called "Wonderland," which it describes as its "first weekly live music performance series in nearly twenty years." The series will be based in Los Angeles and co-developed with MTV's sister network Comedy Central. It will include three musical performances per episode as well as comedic acts and an ensemble of hosts. A dozen other new shows and specials were announced by the network on Thursday ahead of its annual upfront presentation to advertisers. Viacom has been under intense pressure to revitalize MTV and restore the brand's relevance among young viewers. Some would-be MTV viewers are gravitating toward streaming video competitors at the network's expense. So what's MTV doing? It is spending a lot of money on new programming. Its slate includes a long list of scripted dramas and comedies. But its announcements about music are particularly noteworthy. The channel has been criticized in recent years for moving from music videos and music-themed programming to original scripted shows. "Unplugged" is an example of MTV's legacy. Since its inception in 1989, it became one of the network's most popular broadcasts during the MTV's golden era of the late eighties and early nineties. Recently, the show had become a series of one-offs, with the last performance coming from Miley Cyrus in 2014. It will now be brought back as a recurring staple that will be shown at least once a quarter. "The revitalized 'Unplugged' will restore key elements that made the franchise so groundbreaking in the first place, while resetting the show in the multi-platform video world of today," MTV said in a statement. As for "Wonderland," the series looks to be MTV's attempt to create a weekly broadcast that must be watched live. "Live performances are the beating heart of every episode and this show will provide a platform for artists to experiment with the unexpected, express their creativity in new ways and deliver one-off performances that will become inked in the public consciousness," the network said in a statement. "Wonderland" has been described by MTV president Sean Atkins as like "'SNL,' but with the music and comedy flipped."